The sun was setting over Ocean City, NJ on a cool Friday night in early May. As the series of bridges linking the mainland with the New Jersey barrier islands came into view it was time to contemplate the task ahead. 'Was the plan in place, will the schedule work, what's the back up and what's the destination at the end game? Did 'The Captain' pack the T-shirts for all? So many questions, but the most important of all...would the 'B' word be mentioned?' ...Brigantine! The downtown location was easy to find. Scaling the steps in a manner that would make a Mountain Goat jealous the recipient arrived at Room 1867 (that's the necessary Sheffield Wednesday reference dealt with). Rapped on the door in the style of a Yellow-bellied Sapsucker, and after passing on the wisdom of buying a hoagie at WAWA, the base was revealed. A dim light coming from a side table captured the gathered souls in its path. Most of the gang were in place preparing for the 'Big Day' as it is known by some. The instruments for the next 24 - 30 hours strewn across the room- notepad with tables full of timings, the obligatory DeLorme and 'roof prisms' on the table. A bleeping cell phone alerting us that 'The Captain' would arrive in 30 minutes. Were we all ready? Thirty minutes passed, 'The Captain' arrived on cue and we were soon making our way out of the coastal resort heading north. As we crossed the nearby Cape May/Atlantic County line all of our phones went off simultaneously, each of us receiving the same message. The anonymous messenger demanded the following code be cracked before the midnight Great Swamp rendezvous! 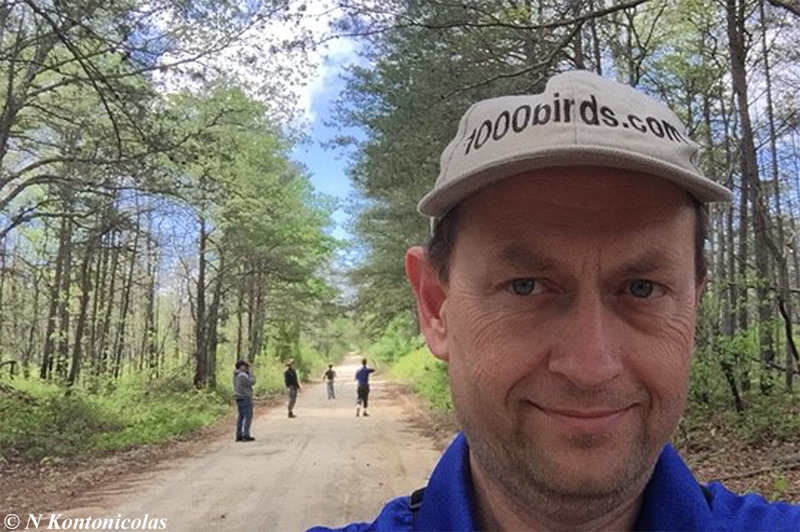 Yep, it was that time again, another attempt by Team 1000birds at the World Series of Birding. The above text may be a million miles away from a novel by Clancy or Forsyth (Fred not Bruce) and would even make Dan Brown cringe. If you do want to find out how Team 1000 birds fared at WSB 2017 then please check out my trip report at 'Birding Trip Reports - Cape May, NJ, USA'. Alternatively, please click on the following link - Cape May and World Series of Birding 2017. It's a full trip report covering the birding week both before and after WSB as well, mainly in and around Cape May, NJ, USA. Birding video compilation to follow soon on my YouTube channel, enjoy. Did Captain Nick go to Brig during the World Series of Birding? Click on the link to find out. Go on, crack the 7-worded code!